For optimum growth, grass needs a proper balance to grow well; sunlight, air, water and nutrients. Provide too much or too little of any of these and your grass may die or suffer. Grass will do well if provided these four things and enhance your landscape and provide a safe place to play. Grass gets three of these four essentials form the soil; air, water & nutrients. In certain areas, many soils contain too much clay and are too compact to provide these essentials well. In other areas, too much sand is an issue causing the water and nutrients to leave the root zone faster than the grass can take it in. Not properly preparing your soil before planting can lead to more problems and expenses later. It’s best to do it correctly from the start. The best soil types for turf grass are sandy loams (soil has some sand and some organic matter) with a pH of 6.0 to 7.0. However, this idea soil is rarely found on properties. So, we create our own soil that will help our lawns flourish. “The beauty is in the blades, but the ‘action’ is in the roots” is a good adage to remember. It is best to prepare your soil to a depth of about 4 – 6 inches for deep root penetration. Deep roots will make the lawn more drought resistant and a more efficient water and nutrient user. It will make the lawn more dense, which will crowd out weeds and resist insects and disease. Clear the site of all building materials (wood, cement, bricks, etc), as well as any buried objects; rocks, stumps, stones or debris that is larger than 2-3 inches in diameter. Rough grade the entire area to eliminate any drainage problems on the property. This should include sloping the grade away from any building foundations. A tractor mounted blade and/or box are most often used for rough grading. If the area is smaller, you can use hand tools. Next, till the earth to a depth of at least 2 inches. This should be done prior to adding any topsoil or amendments. This will control annual weeds and alleviate subsoil compaction. You may to do this a couple of times if planting over a very weedy area. 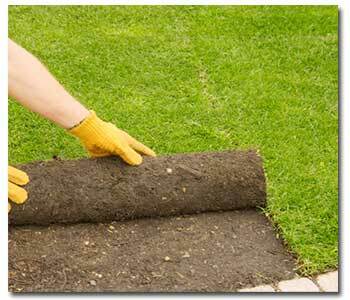 Add amendments/topsoil to achieve a depth of 4-6 inches, after firming. We recommend Gardner & Bloome® Soil Buiding Compost. Apply a starter fertilizer high in phosphate or use a topsoil that provides a starter fertilizer such as Kellogg® Topper®. This should be worked into the top 3-4 inches of the soil to prevent root damage. Finish grading the entire site. Make sure to maintain the rough grading contours and slopes. Roll the area with a lawn roller. The lawn roller is should be 1/3 full of water. This will firm and settle the surface. Your site is now ready for sod or seed. Learn more about growing from sod or seed.